Self inking rubber stamps, sometimes called pre inked rubber stamps, make it easier than ever for crafters to enjoy the rewarding hobby of rubber stamping. What Are Self Inking Stamps? Self inking rubber stamps are different from traditional handle mounted rubber stamps in that a rubber die is typically attached to a plate that strikes a built-in ink pad when the user makes an impression. 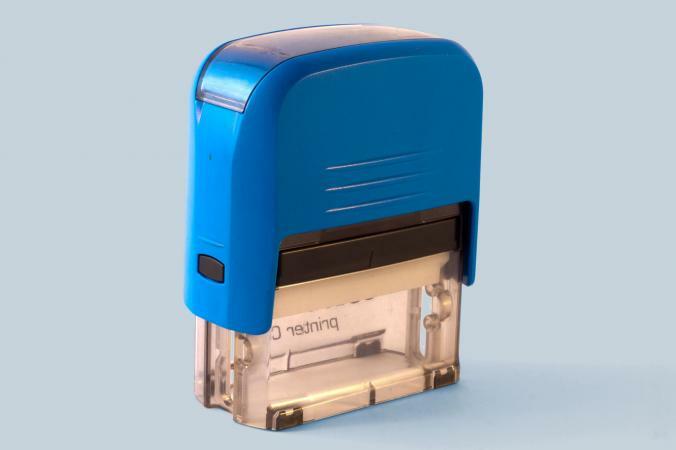 With self inking rubber stamps, you can only stamp in one specific color. However, these stamps are very convenient and can make several thousand impressions before the ink runs out. Self inking rubber stamps are surprisingly versatile. Businesses often use self inking rubber stamps to mark memos, reports, and other necessary correspondence. Self inking personalized rubber stamps that feature your name and address make bill paying and letter writing a less labor-intensive task. Rubber stamps that feature animals, flowers, cartoon characters, and seasonal designs are ideal for kids crafts because they are easier to use and less messy than other types of rubber stamps. If you're planning to use self inking rubber stamps for craft projects with young children, check to make sure the stamp you've selected features washable ink. Wrapping paper: To create unique gift wrap, randomly stamp images over solid colored wrapping paper. For added pizzazz, color the images with crayons, markers, or colored pencils. Party decorations: Self inking rubber stamps come in a variety of seasonal themes, making them the perfect choice for decorating paper cups, napkins, place cards, and other party decorations. Stationary: Make pretty note cards, envelopes, and stationary sets by stamping a border along the side or bottom of plain office supplies. Bookmarks: Encourage a love of reading by having your child make colorful bookmarks with self inking stamps. Laminate the bookmarks for added durability and add ribbon tassels to the top for the perfect finishing touch. Reward charts: If you're trying to encourage your child to keep his/her room clean or study for an upcoming test, use a self inking stamp to create an inexpensive reward chart. Rubber stamping ideas are everywhere you look. Once you've discovered how fun self inking rubber stamps are to use, you'll find yourself coming up with new projects on a daily basis. Make sure the stamp is capped when not in use. Always store self inking rubber stamps in an upright position. Never try to use a self inking stamp with an ink pad intended for handle mounted rubber stamps. Most self inking stamps cannot be refilled when the ink runs out. Attempting to refill a self inking stamp that is not refillable will cause permanent damage. If the stamp is refillable, only use the type of ink specified by the manufacturer.